About Us | Federation of North-American Explorers | Semper Parati! 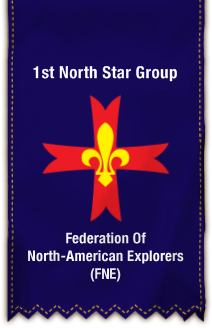 We have chosen for our name, the 1st North Star Group, first, since we are the 1st group in America, and North Star is symbolic of a number of things. First is our great Marian devotion. The North Star is the fixed point that serves to guide us as we explore, it is the light we follow in the darkness also called the Gate of Heaven, Stella Maris, the Star of the Sea. Mary is the light that brings us to Christ, and we hold ourselves to be true Christian gentlemen and ladies and sons and daughters of Mary. It can also be seen as the unwavering truth that the Church represents, and the light that guides us on our path. So the blue in our scarf and den colors is a Guadalupe Blue, specifically recognizing Our Lady of Guadalupe as Patroness of the Americas. The Gold is representative of our recognition of Christ the King. On the natural level, the gold and blue together are seen as the North Star against the sky; and on a third level, the gold and blue are seen as gold for our State color and bird (the Eastern goldfinch), and blue for the sea as we are a coastal state. 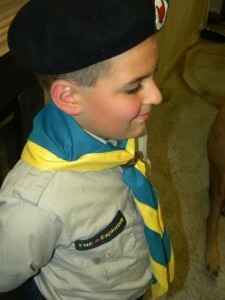 Timber Wolves wear the beret with their promise badge on it. They earn two stars that go on either side before they eventually become an explorer and don the stetson or beret of the North-American Explorer. One of the badges the Timber Wolf wears is the explorer cross (you’ll notice in the banner above). The red cross is representative of the blood of Jesus, and the eight points represent the eight Beatitudes. The traditional fleur-de-lys of the explorer is in gold which is the light and truth of Christ. Our name, additionally, is so that we will remember our brothers from Canada, who were the first group in North America, and who provided such generous support to us as we began our group here in the USA. Without them we would not be here and we will always be thankful for their prayers and assistance from our brother Timber Wolves and Explorers from the Great White North! We follow Baden-Powell’s original program as described in his early works, modified only for reasons of safety and modern hygiene. 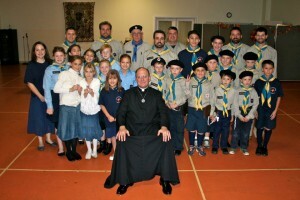 We have a great group of leaders for both boys and girls, ages 6 through 17, and are located in the Diocese of Camden. Please see our Contact page for information on how to reach us. We are not affiliated with the Boy Scouts of America, WOSM, WAGGGS, the Girl Scouts of the USA, or any other similar youth group. Our program is based on Baden-Powell’s original program, which was published only after Lord Baden-Powell consulted with religious authorities, including then-Abp. Francis Bourne of Westminster (later made a Cardinal by Pope St. Pius X). The movement founded by Lord Baden-Powell has been explicitly approved by every Pope since Pius XI. Our movement was founded in 1956 by French and German leaders who wanted to practice Baden-Powell’s principles in a Christian context. The movement was, and remains, Catholic in character. In 2003, the UIGSE-FSE was erected as an international association of the faithful of pontifical right by the Pontifical Council of for the Laity and this declaration was reiterated in 2008.